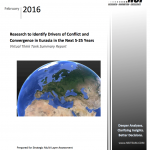 Research to Identify Drivers of Conflict and Convergence in Eurasia in the Next 5-25 Years: Virtual Think Tank (ViTTa) Summary Report. Author | Editor: Canna, S., Bragg, B., Desjardins, A., Popp, G. & Yager, M. (NSI, Inc). The executive summary focuses on the issue of deterrence, which was a recurrent theme amongst the expert responses. From a social science perspective, we first need to ask, what behavior do we want to deter (i.e., Russian “aggression”?) and why (i.e., how does deterrence serve US strategic interests?)? The executive summary focuses on the element of conflict and cooperation with Russia: deterrence, strategic interests, and implications. ViTTa is a virtual network of trusted subject matter experts, unconventional thinkers, brightest minds, foreign voices, and varied perspectives. ViTTa Subject Matter Experts enable NSI to craft timely and cost effective analyses of critical and complex problems. Under tasking from USEUCOM, the effort identified emerging Russian threats and opportunities in Eurasia (with particular emphasis on EUCOM AOR countries). The study examined future political, security, societal and economic trends to determine where US interests are congruent or in conflict with Russian interests, and in particular, detect possible leverage points when dealing with Russia in a “global context.” Of particular interest were Russian perceptions of US activities in Eastern Europe and what impact (positive or negative) those activities are having on deterring Russian aggression in the region. Additionally, the analysis considered where North Atlantic Treaty Organization interests are congruent or in conflict with Russian interests. economic, military, cultural, and political power and vitality. These desires are driving Russian domestic and foreign policy and are clearly entangled with Russia’s aggressive foreign policy actions, including the annexation of Crimea, military intervention in Ukraine, and support for Bashar al Assad in Syria. From its perspective, Russia is hindered in achieving its strategic interests by international and domestic factors including Western attempts to “keep it down” (e.g., NATO enlargement, sanctions, etc. ), low oil prices, slow economic growth, and demographic decline. The United States Government (USG) has multiple objectives in the EUCOM area of responsibility (AOR)—with regional stability being arguably the foremost among them. To achieve this end, the experts felt that USG decision-makers have reverted into a Cold War mindset that engenders a reflexive preference for containment of Russia. They pointed to efforts to expand NATO—an organization established after World War II specifically to contain the Soviet Union—and economic sanctions as evidence of a preference for containment over engagement. However, experts were evenly divided over whether containment or engagement strategies would be most effective in restoring stability in Eurasia. This summary does not weigh in on the optimal strategy, but highlights two competing pathways to stability addressed by the expert elicitation effort: containment and engagement. Few issues exist in Russia that have greater potential to destabilize the country by creating internal dissatisfaction among both the elite and the general population than the economy. Experts felt USG leaders do not fully appreciate the importance of Russia’s economy as the driver of Russian decision- making. The USG uses sanctions as a sort of tier two punishment—below the threshold of military force. However, in Russia, sanctions are viewed essentially as an act of war. There is a mismatch in perception between the USG and the Russian government and people about economic levers of power that is fundamental to this study. Experts noted that economics dominates Russian media and government speeches, more so than Russia’s actions in Ukraine, Crimea, and Syria—as is supported by thematic analysis conducted by Dr. Larry Kuznar. Even absent economic sanctions, Russia’s economy is in serious jeopardy due to low oil prices, lack of economic modernization and diversification, and a shrinking workforce. It is important to remember that Putin’s initial popularity and legitimacy rested on strong support for his policies that resulted in economic growth from 1999-2008. The USG sees Putin as a nationalist and, therefore, aggressive, but Putin does not draw his support from a sense of populist nationalism; he draws his support from economic reform and improvement. It is easy to get caught up in the mistaken belief that ultranationalism is driving Russia aggression, but this term is often misused in the USG. Ultranationalism is not influential in Russian politics, but nationalism is. Experts felt this is concerning because by punishing Russia economically, the West is undermining both the economic and political stability of the nation. So the question then becomes, what does the West fear more: a failed Russian state or a stable, powerful Russia? Containment and engagement actions taken by the United States (both USG as a whole and EUCOM more specifically) can influence Russian stability. Each of these paths create both risk and opportunity for US interests and has implications for EUCOM engagement activities in the EUCOM AOR as a whole. Is it better for the USG to have a stable, strong, and prosperous Russia (satisfied) or an unstable, contained, and weak Russia (unsatisfied)? The first thing we need to know is what conditions are associated with each type of Russia? That is, what do we know about what Russia needs to make it stable/satisfied, and what do we know about is making it unstable/unsatisfied? Because this analysis represents a thought exercise, and requires some simplification, we associate US engagement and cooperation with Russia leading towards a satisfied Russia versus continued US containment and conflict with Russia leading towards an unsatisfied Russia. We then explore the risks and opportunities associated with each pathway. The second part of this thought exercise is to evaluate the implications (at the extreme end of the spectrum) of these pathways for US interests. A stable, economically and politically strong Russia may better serve USG strategic interests as they relate to stability in the Middle East, the shake up of Western-leaning Eastern European nations, the balancing of East and West, and the development of the Arctic. Experts believe the West may be able to find common ground on these issues through a more cooperative relationship with Russia, but an uncooperative Russia could—and does—act as a spoiler for many of these critical issues.6 Furthermore, a more cooperative relationship with the West undermines Putin’s ability to deflect blame for domestic problems—although at least one expert stated that Putin would always be able to spin the relationship in his favor given his control of the media. Because of this, experts believe the only effective mechanism of communicating to Russian elite and the population a willingness to engage is through action—not words. By focusing on engagement vs. conflict with Russia, the West erodes Putin’s ability to message that the USG is the enemy of Russia. It opens the door for the population and elite to see the potential for economic prosperity through cooperation. Additionally, while a satisfied Russia may serve US long-term, strategic interests, this pathway raises significant concerns for Western interests: losing face and fueling Russian ambitions. An overly confident Russia might mistake Western cooperation for weakness and use its new political, economic, and social stability to challenge the international system. This poses a difficult conundrum where long-term US strategic interests are best pursued in a way where any concessions made could be perceived or framed by adversaries and competitors as weakness. 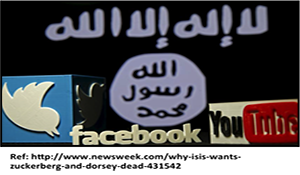 The significant Russia information operation complex will likely play up these developments as a win for Russia at the expense of the West. The benefits of a contained Russia include the maintenance of the status quo for the international community in terms of continued US leadership, the reduction of a conventional military Russian threat to Europe, and support of US allies. While a contained Russia may serve Western interest in maintaining the international status quo, this policy runs the risk of undermining the political and economic stability of Russia in the longer term. A perfect storm of a prolonged, weak economy; rising nationalism; significantly decreased quality of life for Russian citizens; and restricted economic opportunity for the political elite may result in a weak or failed state or the replacement of the current administration with one that is less stable or favorable to the West. State failure and political change in Russia is often abrupt, leaving little time for the West to respond or alter its strategy. Furthermore, the lack of any clear successor to Putin means we have scant information regarding the type of leader – and thus policies – that would ensue. Additionally, Western efforts to contain Russia may increase its reliance on gray zone activities, increasing conflict via proxies, and increased reliance its nuclear threat if its conventional military and other means of influence and deterrence fail. Experts believe that containment of Russia may have unintended consequences fore US strategic interests and regional stability. Third we need to explore the effects of US levers of influence, particularly sanctions and NATO enlargement. The more force we apply to economic levers (such as sanctions), the more we cause Russia to turn away from the West towards Iran and China. Right now, Russia sees itself as more European than Asian, and would prefer to retain ties to the West. However, sanctions are pushing Russia to form alliances with countries outside the sanctions regime, countries we do not want to see getting more powerful. Sanctions may also weaken Putin’s legitimacy, driving him to increase the use of nationalism and aggressive foreign policy to shore up his political support. This may provoke a geopolitical crisis that the West would like to avoid. In the absence of sanctions, Putin is not likely to give up his nationalism rhetoric, but it might give him options other than aggressive actions, to enhance his legitimacy. NATO was expressly created to contain the Soviet Union. It is not hard to imagine why Russia perceives NATO expansion as a real threat—particularly expansion into the area Russia considers to be its near abroad. The danger of NATO expansion in this day and age is that power is increasingly about generating political will and less about sheer capacity. Experts pointed out that expansion has broadened NATO’s membership, but in doing so has weakened the organization’s collective political will. NATO has not demonstrated the political will to defend its newer states from aggression, weakening the effectiveness and credibility of the alliance—although some SMEs challenged this assertion pointing to the recent increase in NATO military exercises. Taken together, these factors point to a critical weakness at the heart of NATO: as the alliance grows bigger, member states’ interests become more diversified, making it increasingly difficult to command unified action in the event of external aggression. When Russia cannot express its power economically, it seeks to do so militarily (not so dissimilar to Iran). The implication of this for EUCOM is that there are risks and benefits to both the containment and engagement pathways for US strategic interests. This summary report covers many issues facing decision makers in the EUCOM AOR and dives deep into expert knowledge from multiple disciplines and perspectives to challenge assumptions and provide nuanced understanding of the issues.